In Let Justice Roll Down John Perkins shares his personal story of injustice and hardship and the way the gospel of Jesus Christ transformed him and called him to a lifetime of pursuing justice rather than vengeance, a lifetime of serving others rather than serving himself. He challenges, much like Amos did, what true worship of God looks like. How in the face of injustice and pain could he go on with life as if it did not exist? What did it mean to grow in relationship with God and turn a “blind eye” to the suffering and injustice he knew existed in the place of his youth? What did God want of him? If Jesus was Savior AND Lord what does that mean for the way God was inviting him to live life? Doctor Perkins challenges each of us to ask such questions of our own lives. Dr. Perkins shares what it was like being born black in 1930 and living in Mississippi. He shares of the poverty which surrounded him daily. He shares of the systems and structures which were designed to keep those for whom the chains of slavery had been loosed “in their place”. His stories of fear, loss and injustice will make your heart break. Losing his mother at an early age, his father no longer around he lived with family who struggled to make ends meet as sharecroppers. After watching his brother die as a result of gunshot wounds from a white policeman John decides it is time to leave and he heads for California. While there he finds hope, promise, and most importantly encounters the love of Christ. 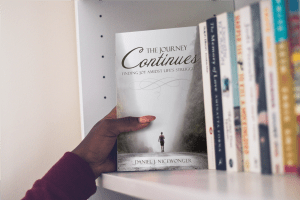 After a time in California he hears God calling him back to Mississippi, away from the better life he has created for his young family and back into the injustice and struggles. Responding to that call he returns with the desire to help people experience the love of Jesus and be set free from the oppression and hardship that characterized their lives. The story of how God used Dr. Perkins willingness to serve is nothing short of amazing. In the midst of horrific situations God continued to work in him and through him challenging systems and transforming lives. The lessons learned during those years have been transformed into models for ministry. All around the world people are using the lessons learned by Dr. Perkins to bring healing and wholeness to the world. His life’s work is all about allowing the power of the gospel of Jesus Christ to transform people and systems resulting in justice, equality and opportunity for all. He believes, as do I, that God desires us to use the power of the gospel to transform lives and this world; seeking out injustice and fighting against it in the name of Jesus. In the chapter thirteen, “The Whole Gospel” he addresses what evangelical Christians often portray as the “either or” option when it comes to evangelism and the social gospel. All too often people are taught that one must chose to share the gospel or meet real needs. Choosing to meet real needs is often portrayed as turning your back upon the importance of inviting people to a personal relationship with Jesus. Dr. Perkins asserts that an either or focus means we are not allowing our lives to be guided and directed by the whole gospel, which robs us of power and prevents us from doing true Kingdom work here on earth. 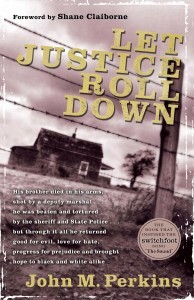 “Let Justice Roll Down” is one man’s story of how God met him in his place of need, transformed his life and then invited him to become an agent of transformation in the world. Dr. Perkins story will challenge how you view the world, ministry, and others around you. Our world could use a few more, okay a lot more, John Perkins these days.